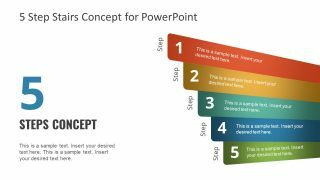 The 5 Step Concept Design for PowerPoint is 6-slides template containing an upside-down staircase illustration. 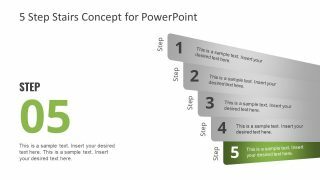 The diagram of 5 steps is a step by step process diagram for multi-purpose professional presentations. Such as the guideline, stages, and steps for research, learning, and organizational procedures. The colorful set of horizontal segments is ideal for displaying instructions. For example, the steps required to perform a root cause analysis for in a specific situation. Similarly, it can enable users to present an interesting visual of business or its marketing strategies. 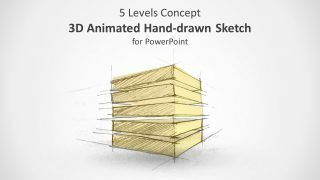 The 5 step concept design shows first step as a top priority through its length. When its following segments gradually become smaller, they portray the lower priorities. 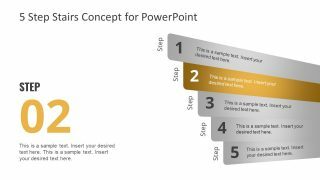 The 5 Step Concept Design for PowerPoint also gives the look of news headlines on TV channel. Therefore, the template can present high-priority topics providing an atmosphere of urgency. Each segment highlights a separate term in distinct colors. 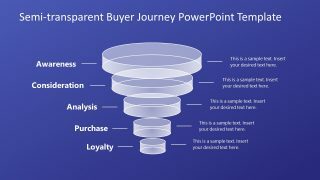 Alternatively, the template can replace the traditional bullet point list design with colorful label segments. 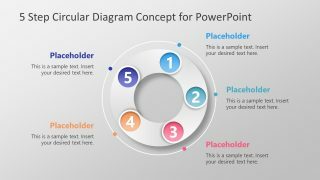 These are the flat design vector PowerPoint shapes, enabling users to modify fully customizable slides. For example, the color of each step and their gradient effects. Further, the 5 steps contain 3 text placeholders each to enter the title and description along with the bold number. 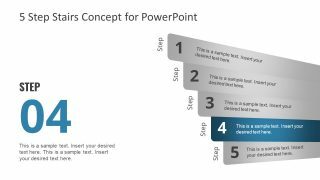 The PowerPoint diagram can make an exceptional concept design for 5 step vertical timeline. Simply, by replacing the “steps” with time like years or months, the users can make a compelling performance review. The first slide of 5 step concept design is a colorful overview. 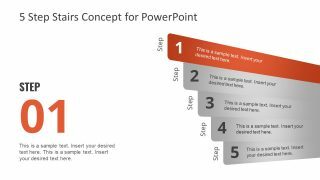 Whereas, the next 5 slides assist the presenter to keep an audience focused on one step of the diagram at a time. 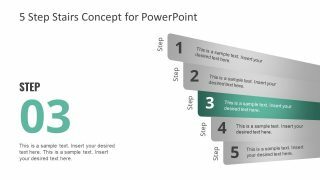 The 5 step concept is a linear flow of information using simple PowerPoint shapes. 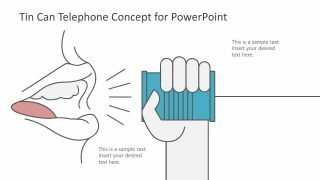 This template is suitable for conveying textual content without too many images and graphics.